Parsnips have a bad rap—and it’s your mom’s fault. But this cream-coloured, carrot look-alike just got a whole lot cooler. 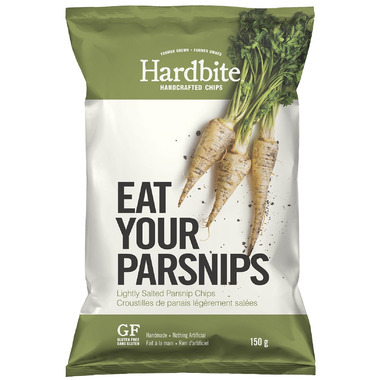 Hardbite Lightly Salted Parsnip Handcrafted Chips are a light crunchy snack that takes this sweet, under-appreciated vegetable and makes it something to write home about. So eat your parsnips, your mom will love it. 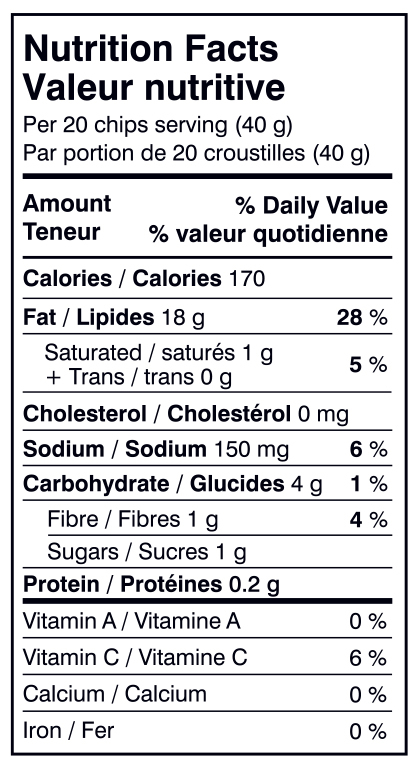 Ingredients: Parsnips, non-hydrogenated sunflower oil and/or non-hydrogenated canola oil, sea salt. I was disappointed. They taste really salty and burnt. Probably won't finish the bag and will definitely not buy again. They are pretty good, but if you haven't had deep-fried parsnips before, they are not crispy, like potato chips. They are more melty than anything, and have a fairly oily flavor. Not bad oily, but you definitely notice it more in these than in potato chips. An excellent choice for anyone looking for a low sugar, low carb, treat. They are crunchy like a potato chip and taste great. I ordered these because it had great reviews, but when I tried it, it was absolutely disgusting and left a weird after taste in my mouth. I threw it out! Good substitution for potato chips. These chips are wonderful, tasty snack. They're tasty, but in the end, a chip is a chip, regardless of how "healthy" it's marketed as. I did enjoy them, but I almost found them to be more addictive than regular potato chips. Definitely worth a try! Soooo delicious! Light parsnip taste. Light salt. Mmmmust try! Would buy again. Amazing product, great substitute for potatoes chips with virtually no carbs. Surpringly tasty. My toddler even ate some! A nice treat without the guilt. Absolutely the best low carb, low calorie delicious and crunchy snack I've ever had! Great sprinkled on salads, with burgers and especially satisfying just alone! Also arrived across hundreds of miles completely intact. Keep them in stock please! I love parsnips and these are so yummy, light, & crispy! The chips of my dreams!!! Salty, crunchy and sooo tasty. Oh and super low net carbs. My new favourite snack. Good for low carb way of eating. These are delicious...and the only way I can get my family to eat parsnips! Need I say more? It's always nice to find a healthy choice when you're a chip junkie like me! These taste fabulous. Even better than any potato chips and much healthier. I like to try new products. These parsnip chips have a nice flavour. They're nicely baked and quite crispy. Wow, I didn't expect these chips to taste so good with just the right amount of salt. They aren't leathery or hard to chew, just crunchy with a light taste like that of spiced up carrots with a bit of salt. They are so good. Dip them in hummus and they are divine. Thanks for stocking these, no more potato chips for me! I was able to find these chips in another store, but they are hard to come by. I really enjoy these. They have a nice crunchy texture and they are healthier than potato chips. I can't wait until well.ca has them in stock because I will definitely be purchasing.